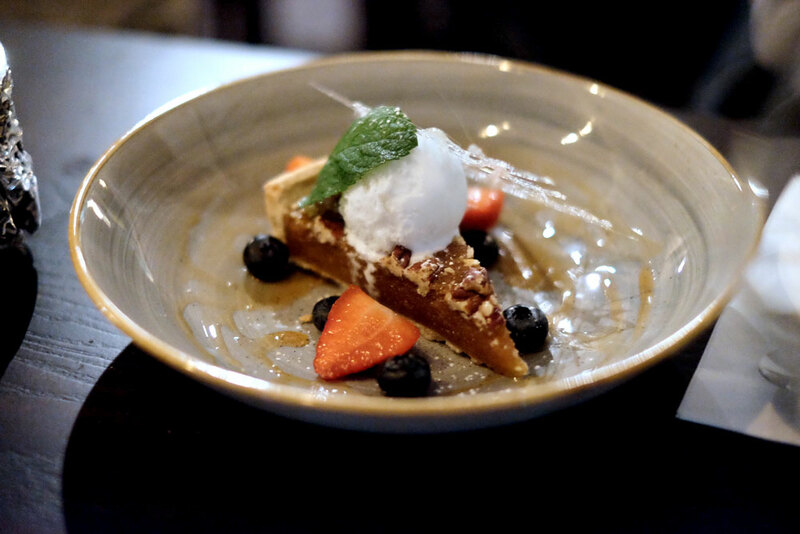 So when The Devon Doorway in Heswall invited myself and three guests to attend their re-opening evening and try their all-new vegan menu, we were intrigued. Though it resides almost on my doorstep, The Devon Doorway isn’t a place I’ve ever been familiar with. But after doing a little digging, it became clear that this place is a bit of a local favourite here on the Wirral. 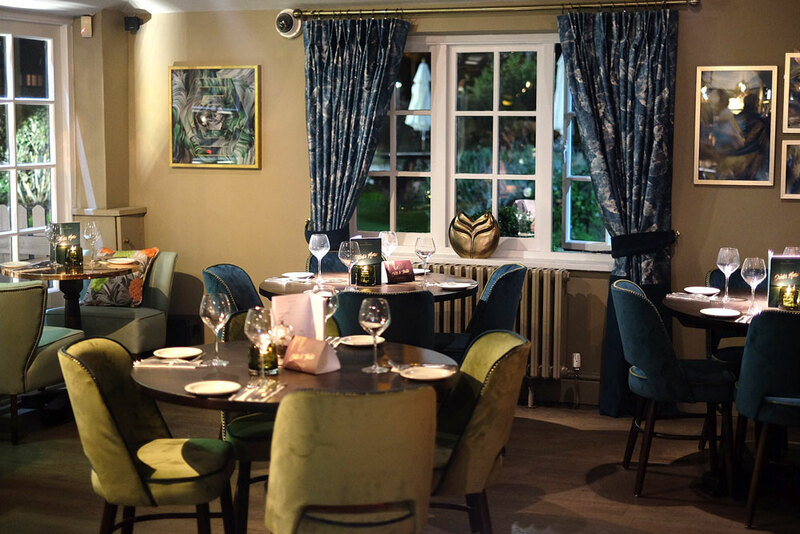 Following a recent refurbishment in October, the restaurant was now reopening its doors…and showing off its new vegan dishes to boot. Ever keen to sample new vegan fare in my area (and also share the deets with you guys), I eagerly said yes. On Wednesday 24th October, my friends and I put on our finest and headed over for our reservation. For the purposes of this review, I’m focusing only on the vegan options at the Devon Doorway. However, it’s safe to say the non-vegans in our party were every bit as impressed with what they consumed that evening. The first thing one notices upon arriving at the Devon Doorway is the warmth and cosiness of its interiors. Step through the entrance door and you’re greeted with the polished art-deco style flooring, warm lighting and luxe-topped bar. Though it was way too cold to be sitting outside, the DD’s outdoor area is warmed with patio heaters and a magnificent roaring fire pit, which only added to the welcoming, rustic atmosphere. 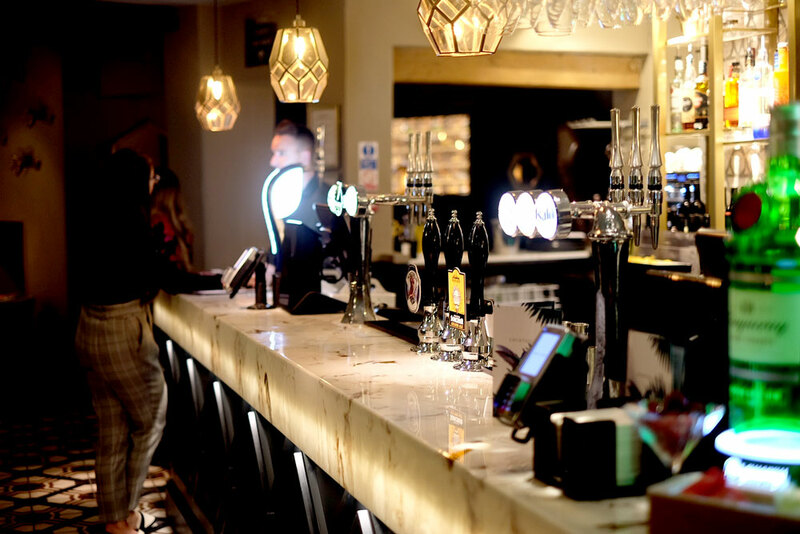 The bar gave way to a softly lit lounge area, lined with smaller tables surrounded by comfy chairs and a pastel shaded colour scheme. It was evident this would be a perfect place for a lazy Sunday lunch, or an intimate date with drinks. The smooth wooden floors helped to maintain a traditional, rustic edge which paired nicely with the modern interior. We were kindly offered drinks by the bar staff who welcomed us, before being shown to our table to sit down. Once we were settled we were presented with a couple of plates of canapés – vegan ones for my friend Rob and I, and non-vegan ones for Christian and Sam. 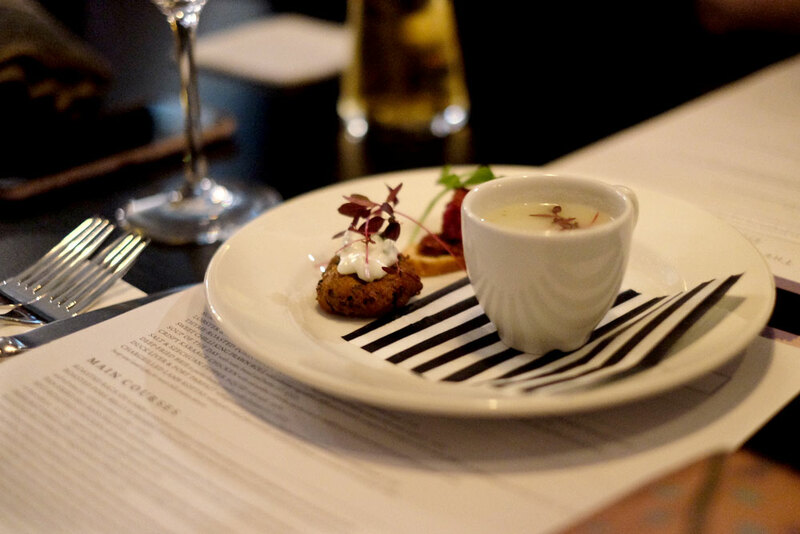 The vegan canapés included falafel balls with yoghurty dressing; rustic toasts with beetroot hummus and little teacups of white onion and thyme soup. Every single one was delicious and it certainly got us excited for the what else was in store. The soup in particular was incredible – really strong flavours, with a harmonious pairing I never would have expected before. After a little time to digest the menu, we placed our orders with our friendly waiters and weren’t waiting very long before our starters arrived. I went for the wholefoods salad, a delicious combination of cauliflower cous-cous, kale, asparagus, tenderstem broccoli, butternut squash, sweet potato, avocado, pomegranate and roasted pumpkin seeds. It was a plate bursting with colour and oozed so much goodness and nutrition, especially as it came dressed in a sweet and zingy pineapple, lemongrass and ginger dressing. I don’t usually order salads in any restaurant due to them always being too oily. You always tend to end up with essentially a plate of leaves dressed in a greasy olive oil dressing. NOT impressive. But this salad was different. Not only was there barely any oiliness (I’d venture to say it didn’t contain any oil at all), it tasted fresh and crisp, not soggy. Every bite was bursting with flavour and they hadn’t skimped on any of the ingredients listed on the menu. (Not a limp lettuce leaf in sight!). The portion size was also more than generous. 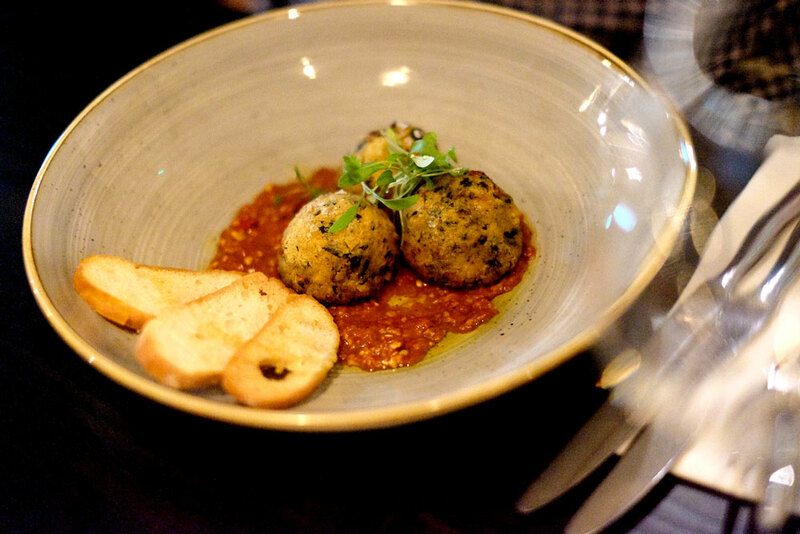 Rob ordered the roasted lentil falafel balls, which came with rustic toast and a Lebanese style dip. I tried some of the falafel and it was delicious – freshly baked and full of flavour. Some falafels found in restaurants can be quite dry, but this one was moist and full to the brim with herbs and spices. 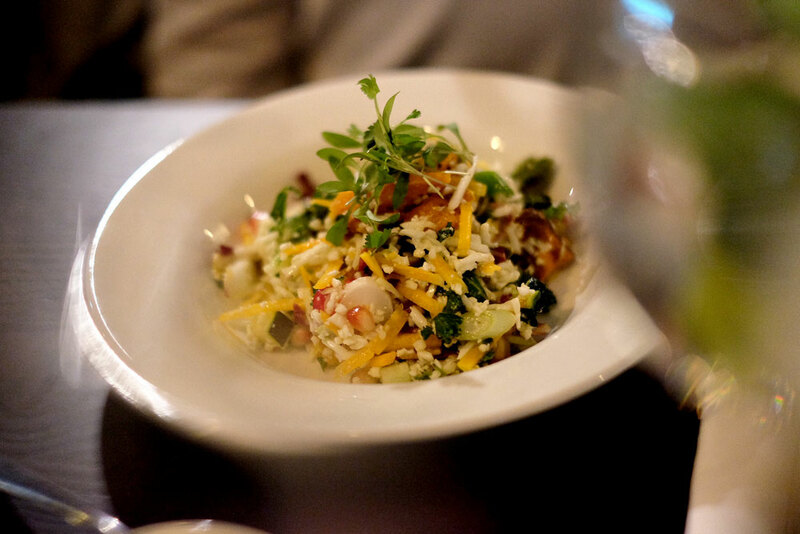 After our starters we were brought some exciting looking amuse bouches – plates of mango and pineapple chunks topped with chilli and spring onion. This isn’t a combo I ever would have thought about trying before, but it worked so incredibly well – the heat of the chilli being superbly offset by the sweetness of the fruit. It really was the ideal palate cleanser to enjoy after our starters. Finally, our mains came, and I could not have been more excited. 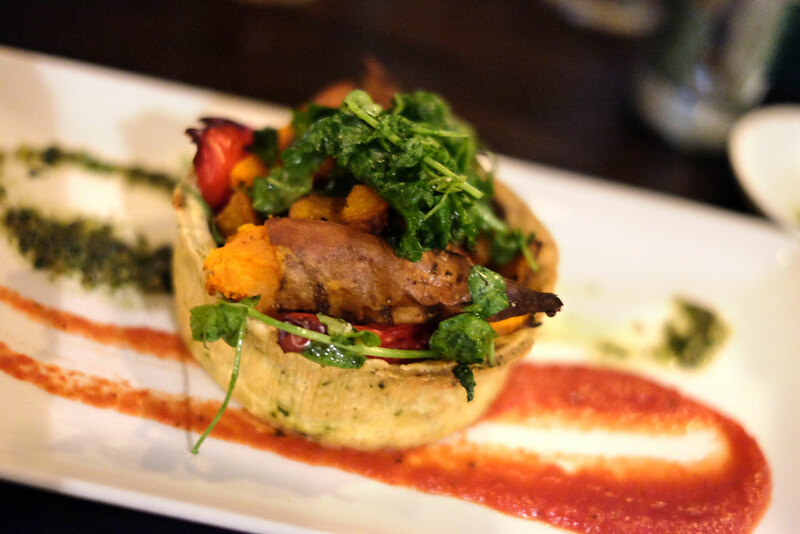 I’d ordered the butternut squash and sweet potato tart, which came beautifully presented as an array of colourful veggies stacked high upon a buttery pastry case, drizzled with a leek sauce. But it turns out I needn’t have worried. After cutting into the tart and allowing it to tumble apart, I saw just how many wonderful, colourful, starchy veggies had been packed into it. The creamy leek sauce was a beautiful touch and really brought out the other flavours of the veggies. Earlier I described the pastry as ‘buttery’, which probably seems strange considering it was vegan. But I really don’t know how else to describe it – this pastry really was so incredibly rich in flavour with a soft, melt-in-the-mouth texture. I was more than full when I had finished…I was stuffed! 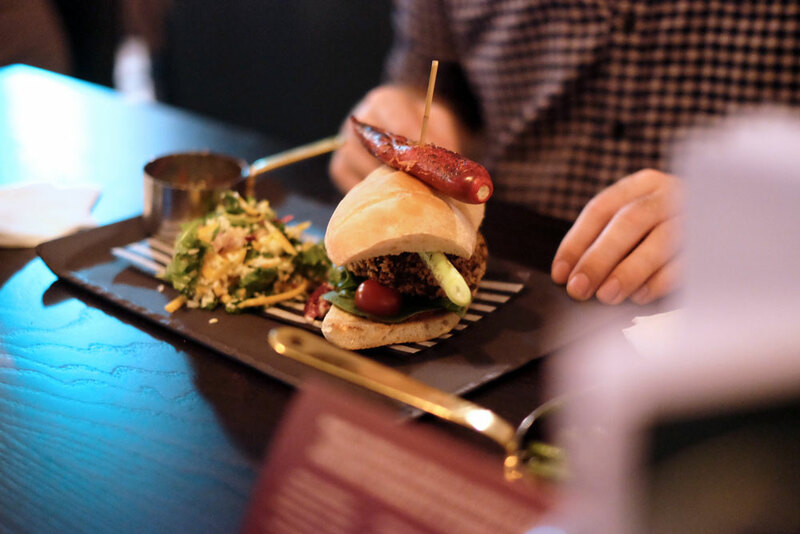 Rob ordered the roasted aubergine, spinach and harissa burger, which came expertly stacked on a rustic roll with a charred spring onion and scorched red chilli. On the side was a red pepper and cumin puree, and more of the cauliflower cous-cous salad I had enjoyed as part of my starter earlier. Being the pal that he is, Rob let me have a small cut-off from his burger and it was incredible – so much flavour and a soft texture yet crispy outer edge. By the time our mains were finished, I was truthfully almost too full for dessert. But dangnabbit, I was determined to make room. Both Rob and I ordered the treacle and pecan tart, which came with a portion of coconut sorbet and a drizzle of rosehip syrup. Quite honestly it was hard to believe this treat was vegan – it was incredibly rich, moist and sweet. I’m not sure what the ingredients were, but the tart was incredibly rich and the coconut sorbet added a creamy component. If I were to eat at the Devon Doorway again, I would probably choose a different dessert as this one was a little too stiff and maybe sugary for me. However I think it would go down great for those with perhaps more of a sweet tooth (and perhaps with less full stomachs than what I was experiencing at this moment!). Next time I would love to try a slice of their chocolate tart, or even a bowl of the coconut sorbet all on its own! Christian’s dessert was an incredible looking melting chocolate and peanut bomb, filled with a sticky toffee pudding, peanut butter cream and served with Bourbon vanilla ice cream. It wasn’t vegan, but I just had to include a picture due to the stunning presentation and the fun moment when the server poured the hot salted caramel sauce on top and you got to watch the ball melt! 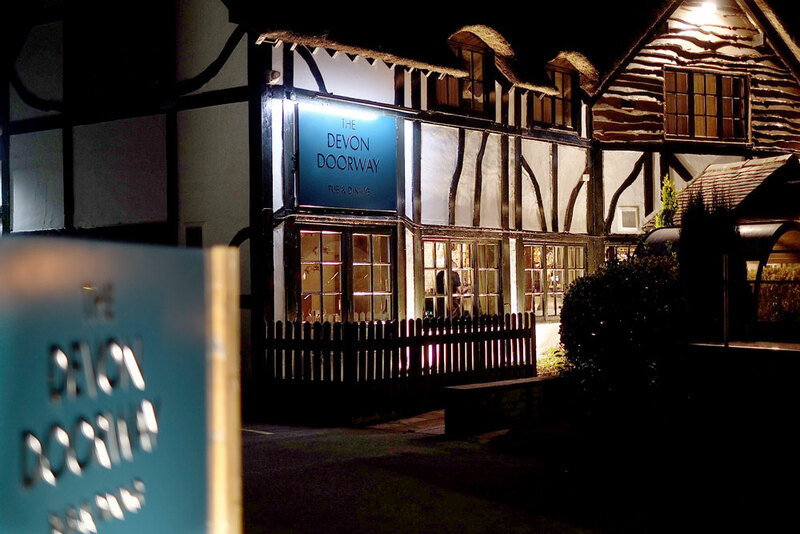 All in all, we had a fabulous night, and I would highly recommend the Devon Doorway to anyone looking to experience exceptional vegan (and non-vegan) food in a comfortable, warm setting. All of the dishes were undeniably moreish and used incredibly fresh ingredients, with innovative flavour combos that worked wonderfully. Though the Devon Doorway is probably affordable for some people, it probably isn’t a place you’d dine weekly (starters average at around £7, and mains vary from £15-25). However it all depends on what you order – their pizzas, for example, are priced very reasonably. Not only that, but the price of the food is more than outweighed by its quality, and I feel it is worth every single penny. As somewhere to go for a special occasion, or indeed, if you’re trying vegan food for the first time (! 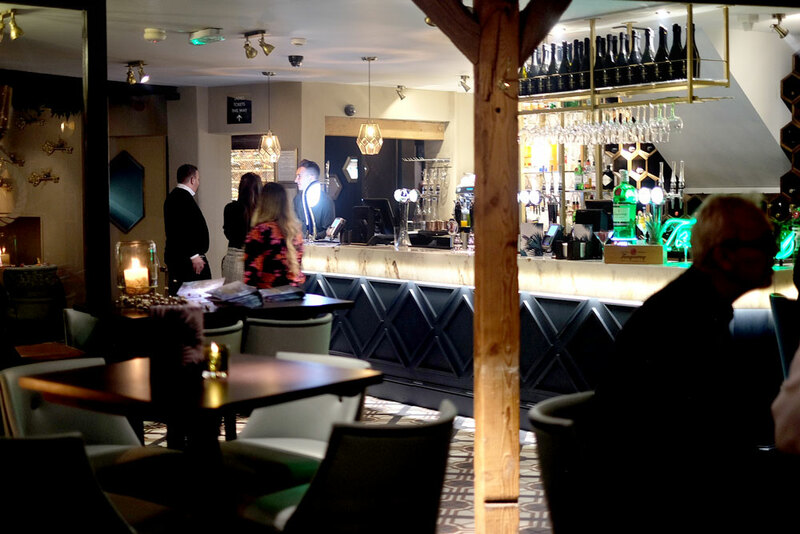 ), the Devon Doorway in Heswall is perfect for a dining experience you’ll never forget. 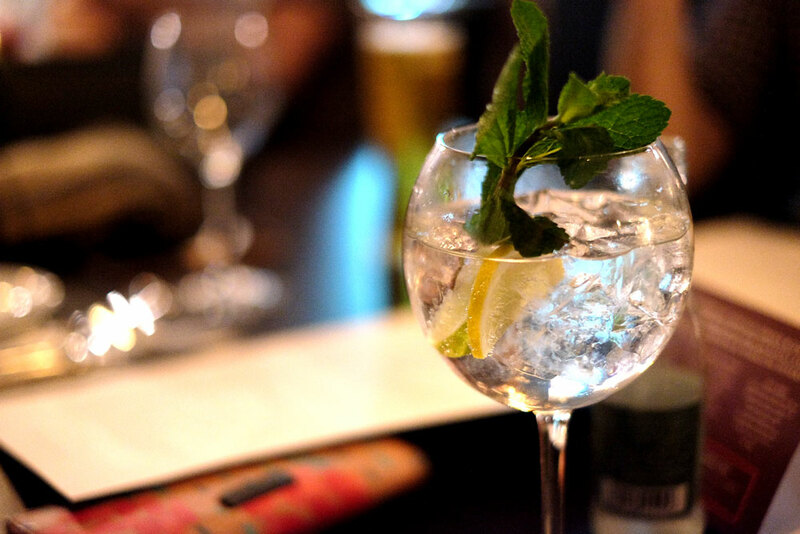 You can check out the restaurant’s website and menus here: https://www.thedevondoorway.co.uk/.